I have to say, I really was looking forward to my first 5-day week. Back when I only worked 3 days a week anyway my husband would always ask me the day/night before I went back after a break if I was excited about going to work. I usually was pretty neutral and sometimes really dreading it. Excitment was rare. But on Monday night, I was excited. I've really enjoyed this regularity and life rhythm that a lot of people have with the 5-day work-week. I've developed a bit of a routine which is very comforting. I go to bed at the same time every night and I've now trained myself to become tired during the last hour. I received two new pictures this week from a student. I was (naturally) super excited when they were presented to me and they're on my door now. Getting handmade stuff from kids is the best perk of my job, just under getting to use as much hand sanitizer and Lysol as I want. Do you know that you shouldn't take ibuprofen (this means Advil or Motrin, which are the same drug) on an empty stomach? (It can tear up your stomach and/or make you vomit.) Do you also know that you should try not to take extra Tylenol that you don't need? Like not taking extra strength unless you have extra strength pain and not taking Tylenol PM just to fall asleep? (The PM in Tylenol PM is Benadryl. Just take Benadryl if there is no pain.) These are just some fun little facts I've found not everyone knows. My husband is having a "guys weekend" with his high school/college friends in Boston this weekend. While he's gone I am catching up on some movies he's not interested in. Last night I watched Albert Nobbs. I liked it and I might do a review of it. For now I'll just say that I recommend it if you like movies about the woes of Ireland, Glenn Close, and/or gender theory. Our church is doing some collective fasting during Lent. The bulletin asks the whole parish each week to give up one thing for just one day of the week. On Sunday if you've done the fast then you get to put a rock at the foot of a cross at the front of the church. We missed the first week because we were both out of town. This past week was to not watch TV for a whole day. We looked at each other and said, piece of cake. We're pretty much Mennonite. We easily go days without turning on our TV, but we do watch a few shows online each week and we did the fast Tuesday so I get to put a rock up there for us on Sunday. I think next week is the internet and THAT will be the challenge. Did you watch the Oscars? Did you get to see the whole thing? I stayed up last year to see the whole thing because I didn't have to work the next day, but I was too tired this year and I'm soooo sad I missed it. I missed a lot of good stuff I guess. I watched some highlights, but I still felt like I was missing things. Then I saw ABC had it online, but it was the day we weren't watching TV. I didn't have time on Wednesday and when I went to watch it last night, it was gone!! Anyone know if there is still a way to watch it? PS: I know it's cheating to add something else, but I forgot to work this in and I don't want to miss it! This week I was nominated and nominated 9 other wonderful ladies for a Libester award. 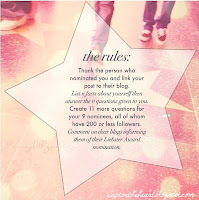 Check out this post to see blogs of 9 great bloggers! Really? When we were in Lancaster our Mennonite buggy-driver said they could have internet but no TV. Is that not right?